The Edwardian triple concealed thermostatic shower valve brings substantial elegance to the modern bathroom. This concealed triple shower valve offers thermostatic showering via three easy-to-operate controls. Operates two shower accessories separately or simultaneously - Fixed head / Slide rail kit, Fixed head / Body jets or Slide rail kit / Body jets. Suitable for all types of plumbing installation this shower valve has the added safety benefit of a built in anti scald device should the cold water supply fail. 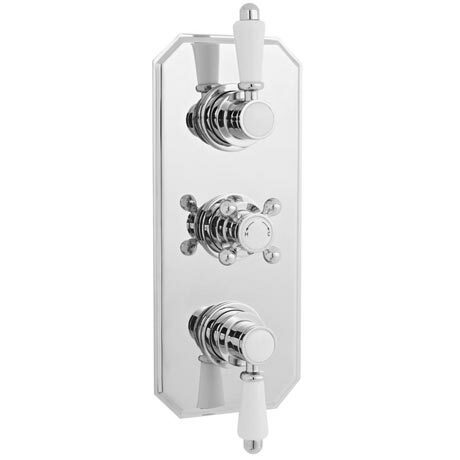 Manufactured using high quality chrome and brass, our range of Edwardian shower valves will look outstanding in any shower enclosure. Q. Does this valve have a diverter that allows either simultaneous or separate flow to a shower head and slide rail kit?